Backpacks have been filled with supplies, wardrobes have been rounded out (can you believe I scored those Under Armour jackets for my boys for just $13 each?!? 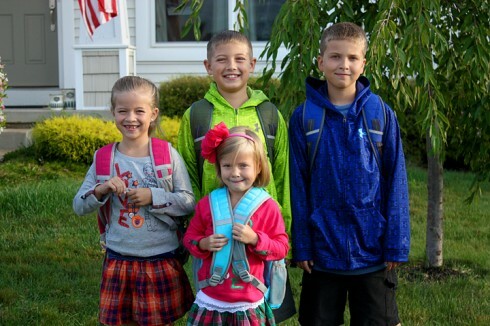 ), and four of my five kids are officially in school. My three-year-old will be starting preschool tomorrow, and this mama is looking forward to a few hours of uninterrupted work time three days a week! However, that doesn’t mean I’m shooing them all out the door in the mornings without a healthy breakfast to start their day. 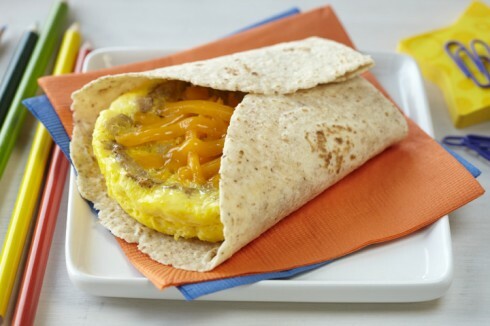 We’ve been on the hunt for quick and easy breakfast solutions, like this Microwave Egg, Sausage, & Cheddar Breakfast Tortilla recipe found on the Incredible Egg website. This high-quality protein-filled breakfast is affordable and gives them the nutrients to start their day off on the right foot. Speaking of starting the day off on the right foot… My kids can be a bit slow moving in the mornings, so a hearty breakfast that they can hold in their hand is perfect because they can finish it off on their way to the bus stop if need be! Plus this recipe can easily be made ahead and frozen so you just need to pop them in the microwave for a few minutes to thaw. Coat 2-cup microwave-safe cereal bowl with cooking spray. Add egg; beat until blended. Sprinkle sausage over egg. Microwave on high for 45 seconds; stir. Microwave until egg is almost set, about 15 seconds longer. Top egg with cheese. Place onto tortilla. Fold bottom of tortilla over egg, then fold in sides. Like the Easy 5-Minute Breakfast Egg Muffins recipe I shared previously, this recipe is endlessly customizable by changing up the meat or adding various condiments! Do you have an incredible kid? Or has a family member accomplished something special? Head over to The Incredible Fridge on the Incredible Edible Egg Facebook page to share the news. You could win incredible prizes like an iPad 2, digital cameras, and a year’s supply of eggs! Enter through 10/28/11. Also, be sure to check out some of the great back-to-school egg recipes, cooking tips and more on their Facebook page! This post was brought to you by the American Egg Board. As always, my participation has been voluntary and the opinions contained within are completely my own! Previous Post: « World Market: Surprise Birthday Gift! Love this post! Such a easy breakfast. Super cute kids. Thank you! Microwaving anything with fats or proteins is dangerous! If you are making this for 5 children, making it on the stove top would also be more efficient. I get worried that so many folks do not heed the dangers of the microwave oven. It ruins whole food, just kills it! On the stove top, this breakfast is a winner. I agree — I’d use the stove generally, but the microwave could be a great option if you only have to make them for one or two kids if you’re careful. @birthrightrose – Please enlighten me on the dangers of the microwave oven. I use it a lot. I’m not a great cook and often in a hurry. And I’m pretty lazy. :) How does the microwave ruin whole foods? If I were making these, it would only be one at a time since I have no kids. @Tara – What do you mean by “if you’re careful”? Careful of what? Eggs can expand when cooked in the microwave, so you just have to make sure that you use an appropriately sized bowl and keep an eye on them while cooking until you determine the correct timing for your microwave. Is the deal still going on for the Under Armour shirts? That’s an awesome deal. I picked them up at an Under Armour outlet store just a couple weeks ago. They had a whole rack of them and only a few were marked, so if you have one near you, it might be worth checking out. Thanks! I just called and they are out. Bummer! Thanks! looking for a cheaper option for my husband to take while he drive 1 hr to work each day.. so fast and easy!! !